25 years ago, converting paper and film documents to digital files was a little like rocket science. There was a mystery to it and to the technology involved. Today, things are very different. Document conversion is almost taken for granted, as if it’s little more than photocopying. But the reality is, scanning isn’t even close to photocopying. Document conversion teams provide an important service to your operation. But in this tight budget environment, have you considered outsourcing a portion or the entire process in order to be able to utilize those individuals in more value laden projects? 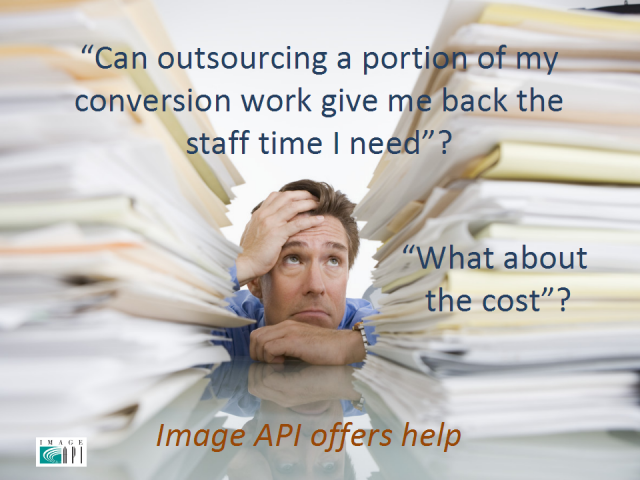 If so, this webcast will provide to you an insight into how a conversion company would price this work in order to give you an idea if outsourcing is an option based on service levels and costs. We also will give you some insight into key aspects of this work to make sure your operation is meeting minimum standards.